Seeking True North, Day 11: Ottawa, ON, to Iqaluit, NU. Having learned the ins and outs of northern air travel, we did our homework last night and learned that First Air, which specializes in service to the NWT, Nunavut and Nunavik (northern Quebec), restricts carry-on bags to two, totaling 20 pounds maximum weight per passenger. 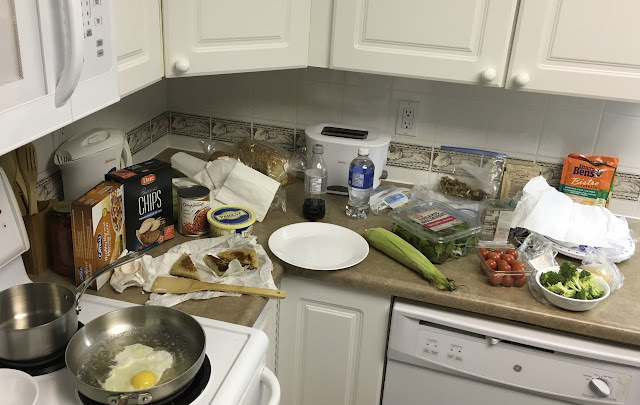 After our experience with the Yukon airline, we were not surprised and we prepared to check a bag. 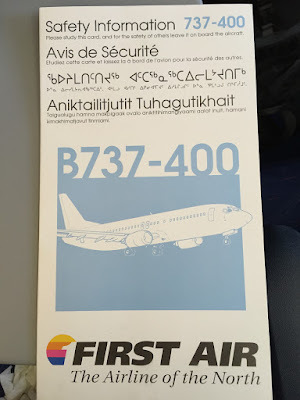 When we arrived at the First Air desk this morning, the ticket agent informed us that First Air would try to get us to Iqaluit (ih-KAL-oo-it) today but the alternate was Kuujjuaq (KOO-joo-ack) in northern Quebec. Upon our request for clarification, she realized we were not regular passengers to the North and explained: "Iqaluit has two seasons: fog and blizzards. Today is a fog day. We'll attempt to make the landing when we arrive. 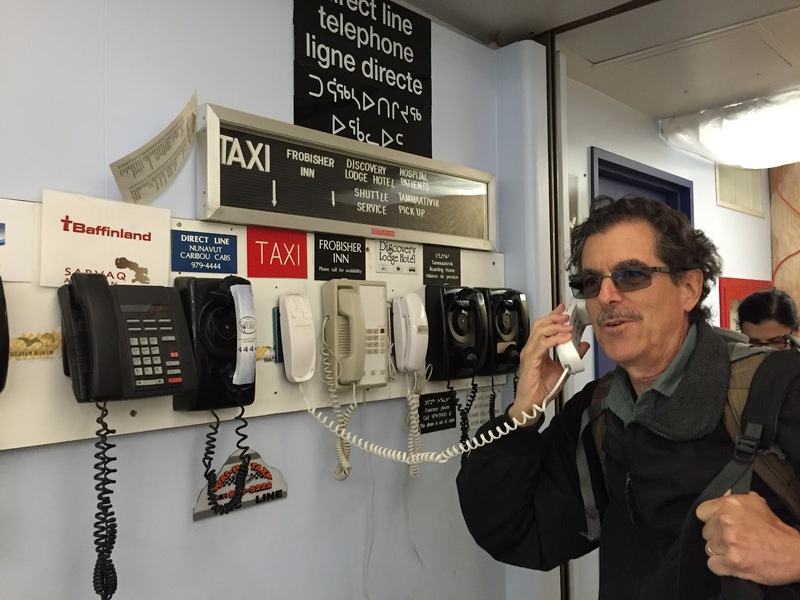 If we're unable to, we'll go to Kuujjuaq, refuel, and try again. If the second attempt is unsuccessful, we'll return you to Ottawa." As we walked toward the security checkpoint mulling over the possibilities for today's adventure, the same agent rushed over to us and said, "There's been a change of plans. The back-up today is Goose Bay, not Kuujjuaq." Interesting. 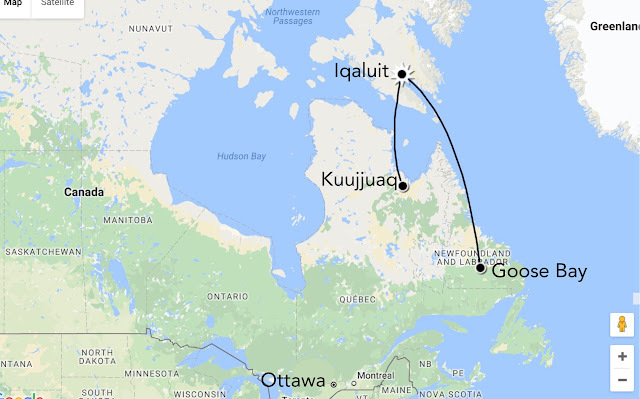 Kuujjuaq is 390 miles from Iqaluit—about an hour and a quarter by air. Goose Bay in Labrador is twice that distance. 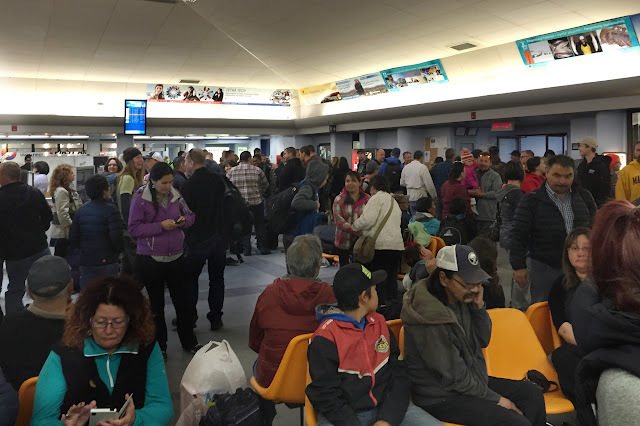 By the time we arrived at the gate and boarding was being discussed, the back-up location had been changed back to Kuujjuaq. Ultimately, the decision was made to delay the flight by 35 minutes. Through some meteorological voodoo, that turned out to be the perfect recipe. A little more than three hours after leaving Ottawa, we landed in Iqaluit just after 1 p.m., with no incident and no fog. Like the Boeing 737 we flew from Yellowknife to Ottawa, the plane to Iqaluit was configured with three-seat rows. Most rows had an empty middle seat, including ours on both flights, greatly increasing comfort on a three- or four-hour flight. Our first look at the Inuktitut alphabet and language. 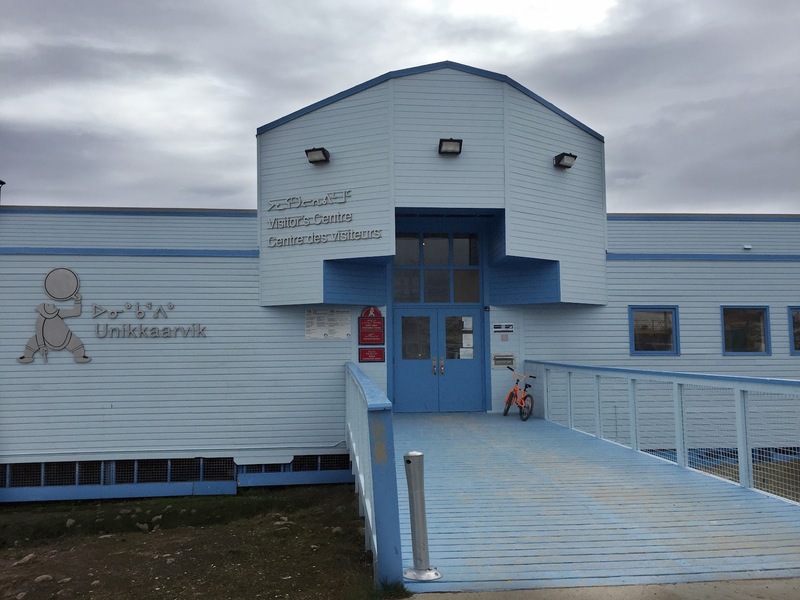 The fourth language is Inuinnaqtun, a dialect of the Inuit language using the Roman alphabet. 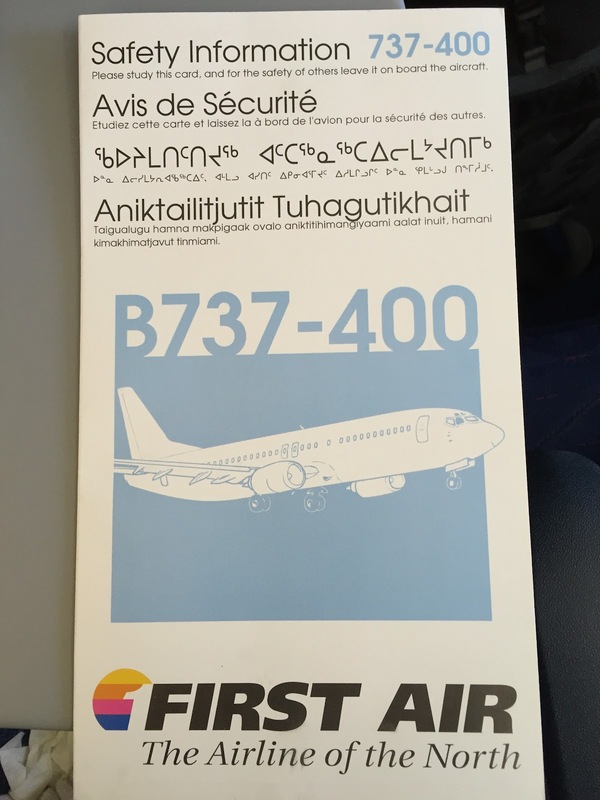 Announcements on the First Air flight were given in English, French, and Inuktitut. As usual, during the pre-recorded safety briefing, the flight attendants held up props (seatbelt, oxygen mask, etc.) during the English and French versions of the announcement. Strangely, during the Inuktitut message, they did not, rather standing in place appearing bored. It seemed disrespectful. 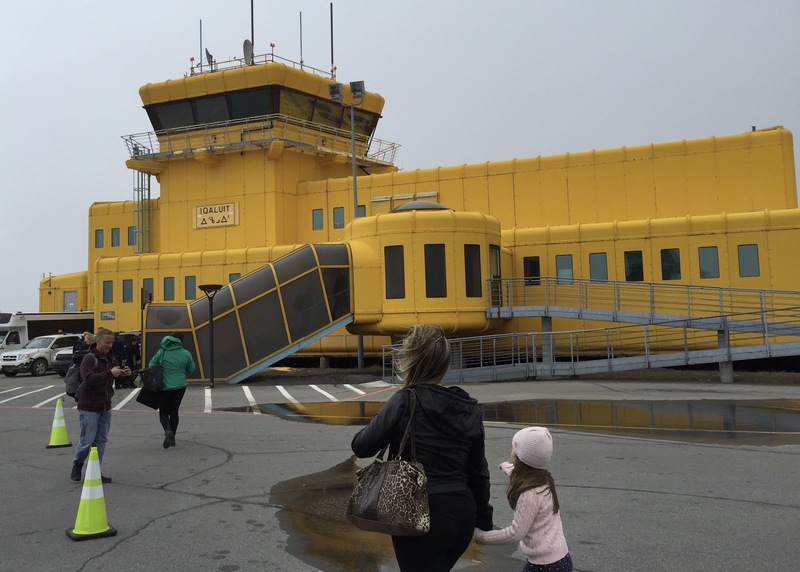 Iqaluit's "yellow submarine" will be retired next year when its replacement is complete. At the little Iqaluit airport, fondly dubbed the yellow submarine for obvious reasons, we deplaned on the tarmac and immediately realized we had accomplished our goal of finding cooler weather. Temperature was a breezy, refreshing 41° under overcast skies. Passengers were hustled into the terminal, through the compact gate area and into a small arrivals/departures hall teeming with people. 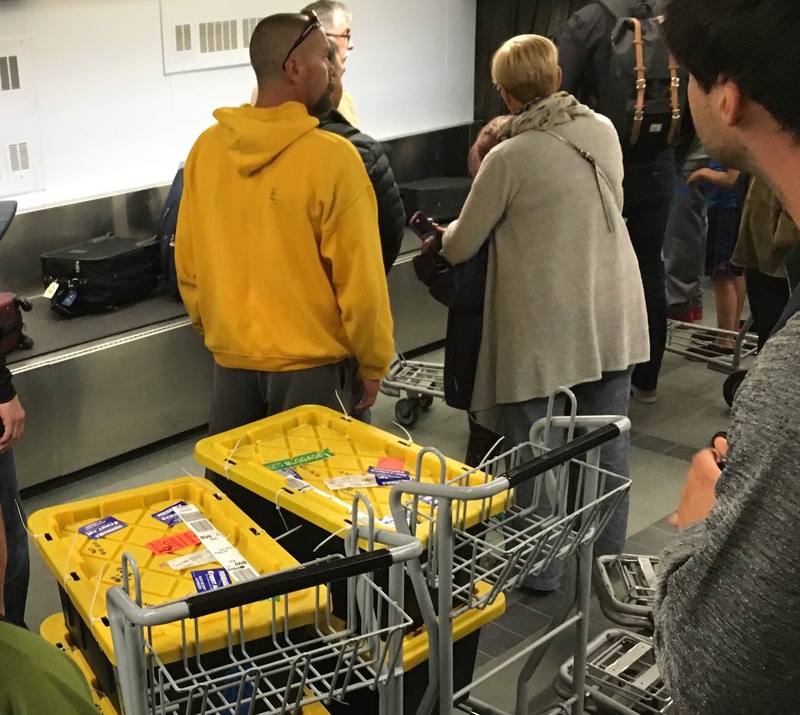 When massive numbers of bags and other containers began to appear on the single conveyor belt at baggage claim, we learned why so many locals had come to greet the plane. Is there anyone left in the town? It was Christmas in August in Iqaluit. 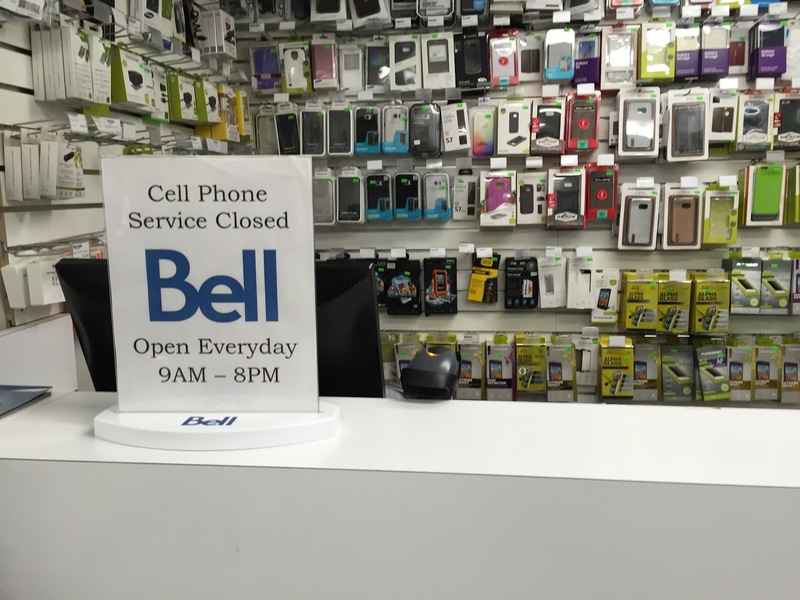 Due to the town's remoteness—reachable only by air and for three months a year by sea—the cost of consumer goods is generally double or more what one would pay elsewhere in Canada (in the South, as locals refer to the remainder of Canada). So when Iqalummiuq (Iqaluit residents) go south, they shop, picking up products for a fraction of their cost at home. Because of First Air's generous checked baggage policy (two 70-lb bags free), purchases are packed in large tubs, sealed and checked as luggage on the flight north. Seeing passengers with six to eight crates of "bags" was common. Even if you incur a little freight charge, you still come out ahead of the local prices for consumer goods. Though we found no information desk at the airport, a kindly Newfoundlander on assignment in Iqaluit guided us on the procedures for obtaining a taxi. We realized the need for one after we determined that Driving Force, the car rental company, was located inside a local NAPA store a couple of miles from the airport. There we found agent Rose, who couldn't have been more helpful. She explained that there's an unlimited mileage policy (though there's nowhere to go) and apologized for the need for a $1,500 deposit against damages. 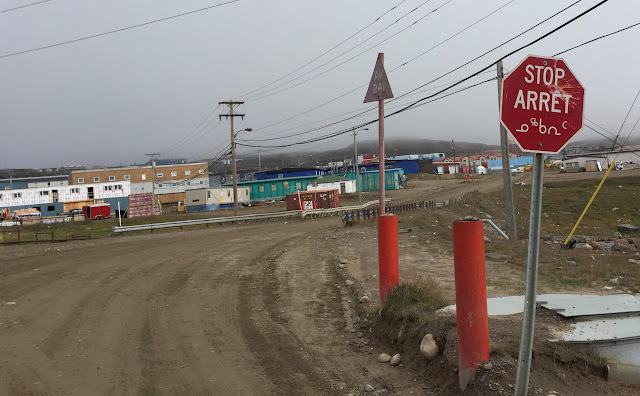 When we asked why Iqaluit had such a high risk of damage, she gave us a one-word answer: Parking. At our request, she pointed out the riskier areas to park, such as near the entrance of NorthMart (the North's equivalent of WalMart, but smaller–and much more expensive). Parking lot damage is so pervasive, she explained, that the NAPA shop has a four-month waiting list for repairs. Our first stop was Capital Suites hotel, our home for the next few days. We certainly were more careful than usual about where we parked. After depositing our bags, we headed off to the tourist information center (TI), eager to find some assistance to kick off our visit. 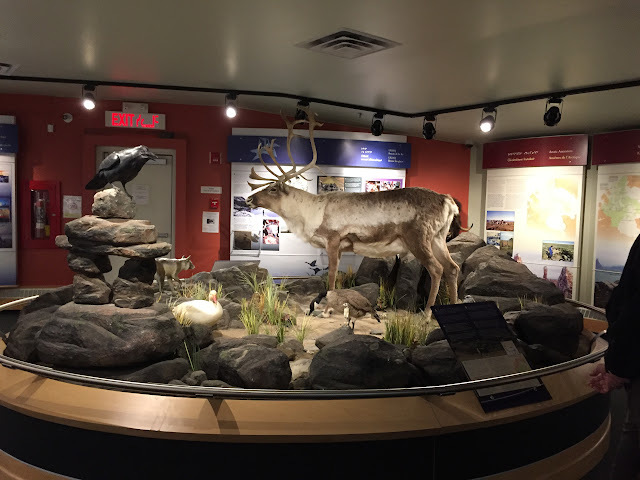 According to the visitor guidebook we picked up with the rental car, "staff [at the TI] can help arrange anything from trips with local outfitters to your own personalized adventure." Well, "Josh," the young man passing himself off as a TI staff member this afternoon, did not get that memo. Q. What are the top activities you'd recommend that we do in Iqaluit? A. There's really nothing to do this time of year. It's going to rain all weekend anyway. Q. 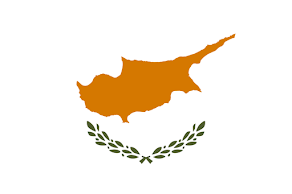 Can you suggest some good restaurants in town? A. I try to avoid going out to eat. All the restaurants here are so expensive. I can eat a lot cheaper at home. Q. Can you help us contact outfitters or other service providers who may be able to take us to places outside Iqaluit? A. You have to book those six months to a year in advance. And they're really, really expensive anyway. Finally we pointed to Lake Geraldine on the town map in the visitor guide and asked if it were worth seeing. 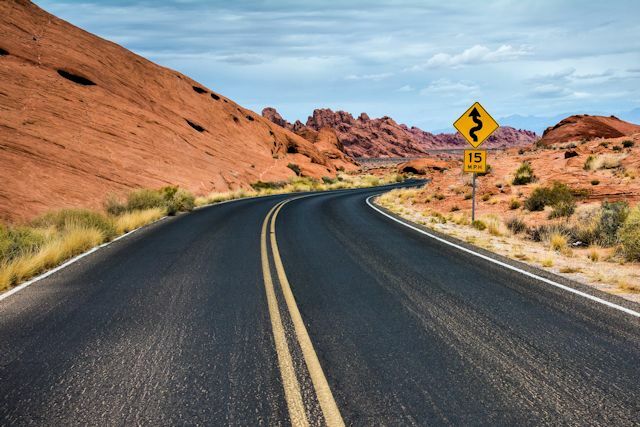 Josh grudgingly agreed that it was and made no objection on the cost to drive there. 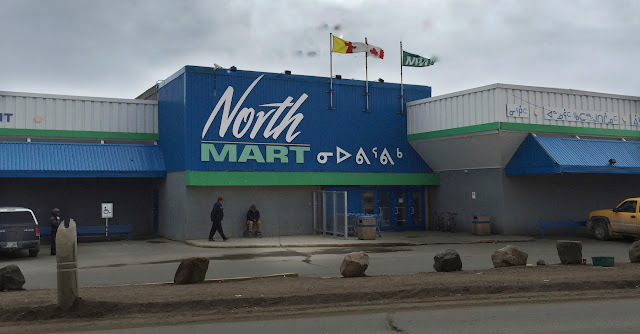 The local NorthMart. Seems innocuous enough at first glance. With flagging enthusiasm for our visit to Iqaluit, we moped out of the TI and drove to the notorious NorthMart, taking care to park in an empty lot in front of the elementary school across the street. After doing our shopping, staggering from the sticker shock (almost $20 for a 12-pack of canned Diet Coke), we returned to the hotel to stash our precious cargo. A bit of sticker shock, for sure. 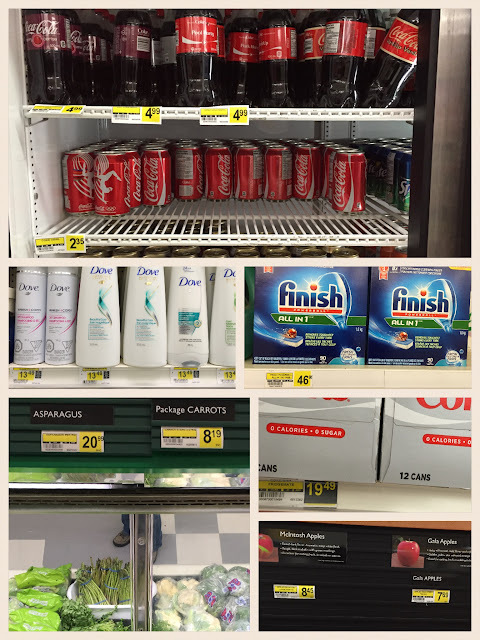 Prices are in Canadian dollars, equivalent to about $.80 US. Then we were off in search of a local cellular provider. When we arrived at the airport, we were a bit surprised to see the dreaded "No Service" notice on our phone screens. Since Verizon has roaming partner carriers worldwide, this was our first such experience. Seeing other people using their smart phones (which just arrived in this part of the world two years ago), we knew the signal was here. Our phones just could not receive it. He'll be back. Just gotta be patient and wait with the other half dozen in line. Locating the cell carrier was challenging. We were able to identify two. When we finally found the office of the first, a painter, dripping brush in hand, answered the door and said the office was closed until Monday. She didn't need to explain why. The next carrier had a small unmanned counter upstairs within a grocery/general merchandise store. After securing a safe-looking parking space, we took our place in line at the counter. 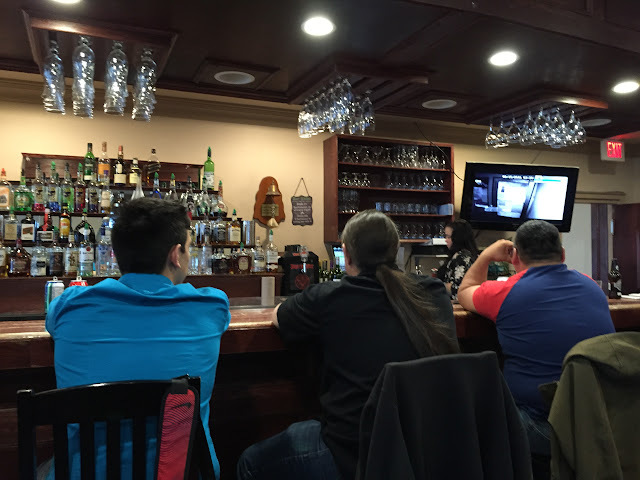 After these downers, we decided to stop at the Kickin' Caribou Pub at Hotel Arctic, one of a handful of places in town that sell alcohol, which is not sold in stores. No cars were parked outside, so we wondered whether the place was open. We took a chance, and indeed it was. Every barstool was occupied, every table in use save one and it looked like it had our names on it. Soon we struck up a piecemeal conversation with Vancouver Island native Tom, our frenetically busy waiter. After offering up some nonsense about preferring Iqaluit's -70° weather to Vancouver's relentless rain, he finally conceded that he's been here five years because he makes really good money. We'd heard the same from Josh at the TI. Later when we asked for our check, Tom laughed. "You thought you were surprised that you can't buy beer and wine at a store. Wait till you see the bill!" $19.70 for a beer and a glass of wine. Yep, he was right. More sticker shock. Returning to Capital Suites and our pricey groceries, we calculated how much we had saved by not eating out. Since entrees at the Kickin' Caribou started at $50, it was substantial, even with the inflated grocery costs. Tomorrow we'll try again to kick off our exciting time in Iqaluit.